You won’t be surprised to learn that almost 80% of employees access social media whilst at work, according to a recent study in the US. Others guestimate that this figure could be considerably higher. With personal use only set to increase, some experts even suggest offering employees a ‘social media break’, replacing the rather out-dated tea or cigarette breaks. But where do the lines blur between personal and company use? How can you ensure that your company’s reputation won’t be affected by your employees’ use of social media, and more importantly, do you have any control over it? Many of our clients ask whether they really need to create a policy. The answer is a resounding, yes! 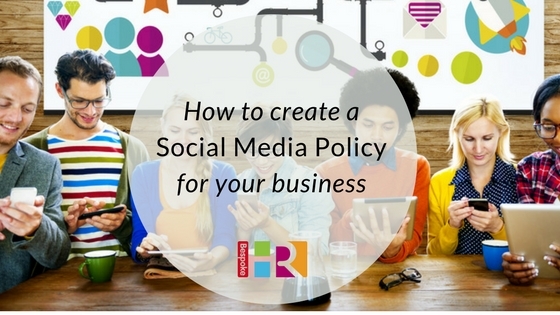 It has never been more important for businesses to cover themselves on social media and put a policy in place. This will clearly state your position on staff use of social media whether on the company’s time, or during their own. We recommend you set out simple, straight forward guidance for all staff to refer to. Involve them in it, canvass opinion on what they would like to be able to do, and work out whether it is realistic. Why not hold a brief workshop with employees once it’s complete to explain to them in person what it means, and how it will affect them. Focus on the culture of the businessIs social media relevant to your business? Does your company benefit from staff use (for example, are they promoting the business)? Remember, you’re aiming to protect both your business and your employees in your policy; so give examples which relate directly to your business to help them understand. Include legal elements to cover confidential information about the companyBe clear on what constitutes misuse with easy to understand examples. Focus on both personal and business use of social mediaThis will allow you to clearly specify where the difference lies. Be realistic and think back to your company culture, is it beneficial for your business to allow staff free access? Think about company posting proceduresIf you have a member, or members, of the team posting on your behalf, have you considered a mechanism to allow you to check what’s being written? If you already have a Social Media Manager, then this won’t affect you. However, if various members of the team are managing your channels, possibly not as a priority, then you may want to think about it. This is easily rectified by using a content schedule or software which allows multiple users to access content at any one time (such as Hootsuite or Buffer). Include privacy settingsMake sure your employees are using the correct privacy settings on their personal accounts, particularly if they are sharing private photos which potential customers or competitors could access. Clarify the boundaries of personal useIf your employees would rather spend more time on social media breaks than actually working, then this is something your policy needs to address. Think about where you stand on staff checking their accounts; how much time is acceptable? If you would like more information or advice on preparing a Social Media Policy, please let us know and we would be delighted to help.